At work today, the Engineering department had a holiday party. Instead of the usual Yankee swap, this year we had a White Elephant swap. Everyone brought something they didn’t really want, nicely wrapped. We picked numbers and started to open packages. It was amusing. One man’s trash is another man’s treasure, and this proved true. I brought an unused electric espresso machine that my dad gave me. He got it when he opened a new bank account. It was something I would never use. When someone opened that gift, someone else said that whoever brought it didn’t read the rules. What they didn’t know is that it had been sitting in my basement awaiting our next trip to Goodwill. When it was my turn, I picked a Snuggie, one of those blankets to wear while you watch TV. Someone stole it from me, almost immediately. My next package turned out to be a few chocolate bars and some peppermint bark. Not bad. A few people threatened to steal my candy, but I managed to keep it until the end. However, my friend Jeanne ended up with DVDs of some horror movies. She barely wanted to touch them and definitely didn’t want to take them home. Not that I watch horror movies myself, but I knew Howard would love to watch them, so, in the holiday spirit, I traded with her. Howard seems happy with the movies, so everyone was happy. Our engineering potlucks are always plentiful and delicious. Our group hails from many different countries and backgrounds, so the food is always varied and interesting. Today was no exception. There were meatballs, a few Indian dishes, a Senegalese peanut soup, and pad thai. There were also many desserts. I brought a spinach pie. I hadn’t made it before, but it was a success. 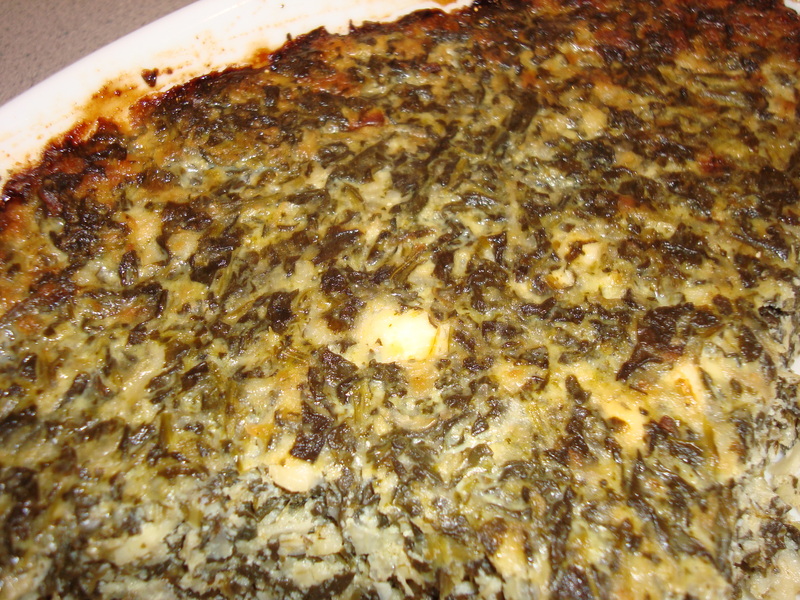 It was a crustless pie, with lots of spinach and cheese, like the filling of a spanakopita. Heat olive oil in a large nonstick skillet and cook the onions with a pinch of salt over low heat. Stir often, until the onions are soft and starting to turn golden, about 30 to 40 minutes. After the onions are caramelized, remove them from the pan and put them in a large bowl. Add thawed spinach to the pan and heat to evaporate any water. Add to the onion and stir together. Rinse the feta cheese and drain well on paper towels. Crumble feta into small pieces. Mix crumbled feta with ricotta and Parmesan. Stir in the beaten eggs. Add a pinch of salt and freshly ground pepper. Combine the cheese mixture with the spinach mixture and mix together thoroughly. Lightly oil a shallow casserole dish, about 13×9 inches. Spoon the mixture into the casserole dish. Bake for 30 minutes. Raise oven temperature to 350F and bake for another 30-35 minutes, until the center of the pie feels firm. Check after 20 minutes. If the top is getting too dark, cover loosely with foil. Cool at least 30 minutes before serving. I prepared the casserole the night before and baked it the next day. I put the casserole dish (which hadn’t had a chance to warm up) into the oven as it preheated, and timed it starting from when the oven reached temperature.